The usage of the detect parameter will prompt the service to try to determine the input format automatically. But caution: Though being a fairly powerful feature, it will not work for every kind of input (e.g. the data format of textual input cannot be recognized). The source code of this tool is available under a LPGL license from here. This service is built on top of RDFLib 4.1.2, an RDF library which allows to parse and serialize between data formats. Furthermore, it is using pyRdfa for RDFa 1.1 parsing, pyMicrodata for Microdata parsing, and rdflib-jsonld for parsing and serializing JSON-LD. For the conversion to RDFa and Microdata we implemented custom serialization mechanisms based on RDFLib's RDF/XML serializer. Unknown namespace prefixes are determined automatically using the prefix.cc namespace lookup of Richard Cyganiak. Alex Stolz, Bene Rodriguez-Castro, and Martin Hepp: RDF Translator: A RESTful Multi-Format Data Converter for the Semantic Web. Technical Report TR-2013-1, E-Business and Web Science Research Group, 2013. This tool has been developed by Alex Stolz, a member of the E-Business and Web Science Research Group at Universität der Bundeswehr München. The author would like to thank Martin Hepp and Andreas Radinger for constructive feedback and ongoing substantial contributions to this project. 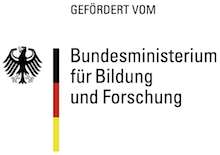 The work on RDF Translator has been supported by the German Federal Ministry of Education and Research (BMBF) by a grant under the KMU Innovativ program as part of the Intelligent Match project (FKZ 01IS10022B).